The Funkees were featured in the Nigeria Special series, but on this reissue we get to dig deeper into their catalog, and in it we find a fiery band with some serious chops. With digital content at our fingertips, reissued albums seem almost unnecessary, or a way to hopefully cash in as much as a label can on content that people can find online for free and, often in the case of out-of-print material, without anyone taking much notice. However, the point of the reissue has, in light of digital democracy, changed. It's not just about giving us old content again, it's about setting it in context, and at its best it's about separating out what deserves to be celebrated again. If blogs deal often deal in obscurity for obscurity's sake, the best reissues seek to make the obscure popular, more appreciated. It's one of a few ways we have left to gatekeep the glut of music all too easily available to us. Soundway Records has proven to be one of the great gatekeepers of the past 10 years or so. Though they explore other cultures and music, they have been a particularly strong shining light in African music and, more specifically, in music from Nigeria. Their Nigeria Special series has been downright revelatory, digging into a time and place -- Nigeria in the late-'60s and '70s -- that popular thought associates with one sound (afro-beat) and one performer (Fela Kuti) to expand and complicate our understanding of it, and to highlight other amazing contemporaries of Kuti. Since the Nigeria Special series, Soundway has taken their focus one step further, crafting reissues of works by single artists. Works like their Monomono/Joni Haastrup reissues or their re-release of the Black Goddess soundtrack have helped us dig deeper into corners of Nigerian music not often explored, and has made the understanding of the region's music and culture richer. Now Soundway returns with another of these focused collections, Dancing Time: The Best of Eastern Nigeria's Afro Rock Experiments 1973-1977, which shines a light on Afro-rock Nigerian band the Funkees. 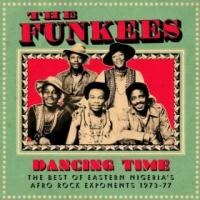 The Funkees were featured as part of the Nigeria Special series, but here we get to dig deeper into their catalog. In it we find a fiery band with some serious chops. If Fela Kuti's music got big and confrontational, spreading out on giant horn sections, the Funkees are a surgically lean counterpoint, a band every bit as energetic but much more contained in their attack. The results are unique and arresting, showing a tighter rock approach to the wide-open sound of Afro-beat and Afro-funk. The band has the driving percussion and bracing group vocals you might expect, but their sound is truly theirs. A song like "Akpankoro" drives forward on a sweaty thump, but it’s the jagged riffs -- a brittle guitar braced by a skronky organ -- that make the song so immediate and eccentric and beautiful. Elsewhere "Point of No Return" coasts on a deep bass, but organ and heavily wah-pedaled guitar weave tangled circles around it. The excellent "Dancing Time" offers no pretense to be more than it claims -- a dancing song -- but though it brings in horns, it's the strange organ vamping in the middle of the song that will catch your ear. The Funkees were, well, pretty damn funky, and Dancing Time proves this again and again, from the charged shuffle of "Acid Rock" to the soul rundown of "Baby I Need You". What makes them distinct, though, are those strange details that break up the smooth groove of these songs -- the seemingly improvised organ fill, the unruly guitar solo, anything to break up the flow of the song. It's not to stop you dancing, necessarily, but more to confront you in a subtle way, to bring you back to the intention of the song, the freedom it's representing, the freedom it's striving for. The band can stretch out and explore, as they do on longer tracks like "Akula Owa Onyeara", but they are at their most innovative and singular when they work within tighter constraints. They can do in three minutes what many of their contemporaries needed 10 to do. It's great to see the variety of sound the Funkees achieved, but how they evolved over time remains a bit murky on Dancing Time. The collection comprises highlights from various 7-inches released in Nigeria and two full-length records -- 1974's Point of No Return and 1976's Now I'm A Man -- released in the UK. It was in the UK that the Funkees achieved their greatest success, crafting great records and selling out shows, but the collection here isn't chronological, so it's hard to see the road they took to get there. What you get in the trade off is a well sequenced collection, and songs that certainly stand on their own, but the timeline of the band, how exactly they grew, doesn't quite come across. It's a small complaint, though, for such a strong set, and in the end the Funkees sound like another great mid-'70s Nigerian band we should pay more attention to, and once again Soundway Records has shown it should be the one standing at that gate, letting out only the things we need to hear. Because, in the end, those things -- including Dancing Time -- also end up being the things we want to hear.